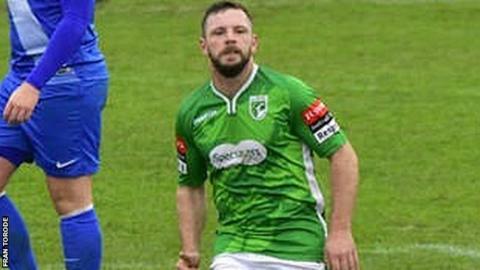 Guernsey FC's Craig Young says the fight returned to the side as they beat Walton Casuals 6-2 to cement their place in the Isthmian League Division One South play-off places. Young, Ross Allen (two), Jacques Isabelle, Glyn Dyer and Sam Cochrane all scored for fourth-placed Guernsey. "We all fought for each other," Young told BBC Radio Guernsey. "That's what was missing last week, we had a couple of people, at times, that were on their own." Guernsey now have a four-point buffer to the teams outside the play-off places as they go into a tough run of fixtures against their rivals this month, including games against play-off hopefuls Ramsgate, Faversham Town and Hastings United. "This season's been amazing on a personal level and on a team level as well," added Young, who has scored three goals in Guernsey's last six matches. "We're still up there, we're fighting and we'll keep on fighting until the end of the season to hopefully make the plays-offs."